In a large bowl, whisk the yogurt with the paprika, cumin, allspice, garlic and the 1 tablespoon of olive oil. Season with 1 1/2 teaspoons of kosher salt and 1/2 teaspoon of pepper. Add the lamb and stir until evenly coated. Let stand at room temperature for 1 hour or refrigerate for up to 3 hours. Light a grill or preheat a grill pan. Thread the lamb and zucchini onto 12 long metal skewers and brush with oil. Season lightly with salt and pepper. Grill the kebabs over moderately high heat, turning, until the lamb is browned outside and medium-rare inside, 6 minutes. 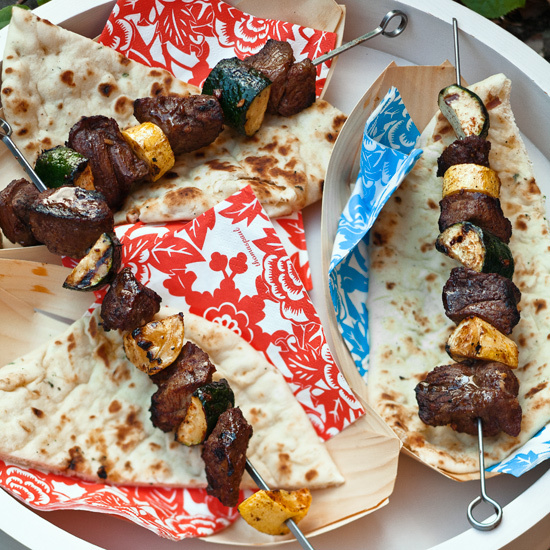 Serve the lamb kebabs with the pita.